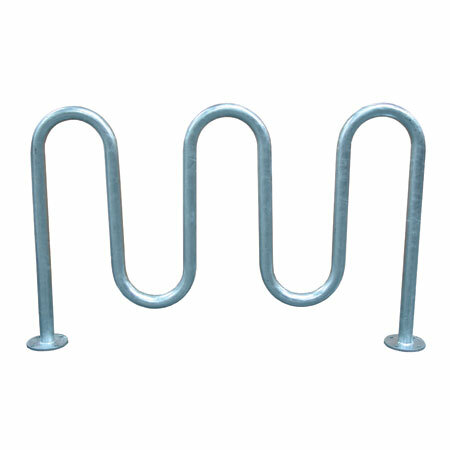 <?xml:namespace prefix = "o" /> Bicycle storage racks give your customers or employees a place to store their bikes while they’re shopping, walking, working, attending classes, or watching an event. There are various sizes to choose from so you will have the option of how much area you designate for those that ride a bike to your building. Choosing one 20 foot bike rack can be done just as easily as arranging four bike racks that are five feet long in a smaller area. Single sided and double sided options give you further choices on how many bikes the frame is able to store at once. With the cost of living and gas prices rising today, many people are choosing to ride their bikes to more places. Having a bike rack outside your building makes it very convenient for people to store their bike while they shop in your store, sit in a meeting, or attend an appointment. Giving customers more options on how to get to your store increases your chances that they will come back to make more purchases in the future. With a better customer satisfaction rating, you will find your profits increase as well. The A frame bicycle racks are made with galvanized steel and come in lengths ranging from 5 to 20 feet. 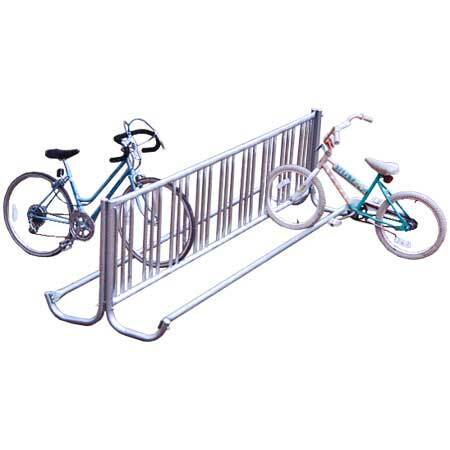 This double sided bike rack allows riders to store their bikes on either side of the rack for outdoor areas that have the available space. Galvanized steel is made to last in harsh weather conditions so you don’t have to spend money or time on maintenance. Placing the A frame bike can be differently depending on your layout. You can have the rack in an area on the sidewalk that shares enough space for walkers and riders, or in a grassy area under a covered area to further protect stored bicycles. J frame bike racks are made from galvanized steel, but have a little different design than the A frame. 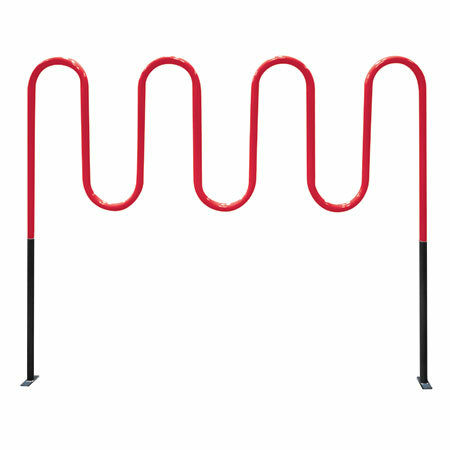 You can choose a rack with a length of 5 to 20 feet. J frame bicycle racks are available in single and double sided so no matter what size area you have room for bike storage, you will find the frame that fits. This portable bike storage rack allows you to move it whenever the need calls for it. The one sided bike storage racks give you the opportunity to have the rack closer to the building if the sidewalk or grassy areas don’t have the amount of space needed to provide an adequate area for both walkers and bikers. Bicycle storage racks present riders with a secure space to lock their bikes when they’re in a building running errands. The frame’s design allows riders to use their frame to help lock the bike or it gives an area for the bike to stand up and prevent it from getting damaged while it isn’t being used. Your customers can decide on what type of lock they prefer to use, if any, when using your bike storage rack. If you have a lot of bicycling commuters, arranging multiple bicycle racks together will ensure that everyone has a secure place to store their bike during the day and night.